A review? Well, the biscuit tasted biscuity, thanks no doubt to the “natural butter flavor” listed along with dozens of other ingredients on the wrapper. 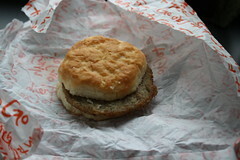 It was more soggy than dry, its texture contrasting sharply with the springiness of the pale pork patty. “Spices,” the wrapper duly noted, and in fact I found pepper flakes in the sausage, responsible for the warm after-burn in the throat. The overall effect is of something which needs condiments; a slug of ketchup, at least. But it hails from a 130,000 square foot food commissary serving 7-Eleven stores across the region, and what do you expect for a buck? Oh, plus tax. Here, then, is the final tally, with each biscuit dish ranked on a scale of 1 to 5.